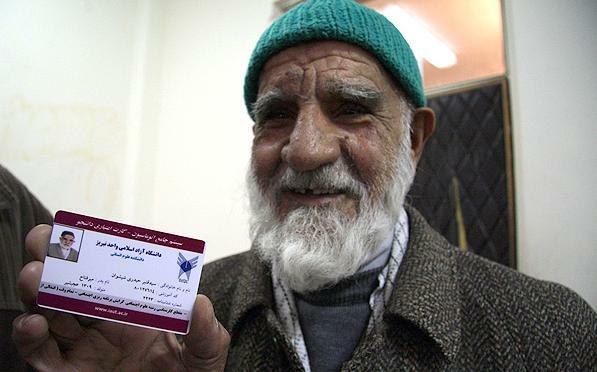 Mir Ghanbar Heydari, 82 year old college student, earned his social sciences bachelor’s degree from Islamic Azad University in Iran. He finished his courses in Tabriz. However the guy was first entered in Jahrom branch but provincial officials helped him to move to Tabriz branch. “Im really happy at this time. Thank god helped me to finish my study. I also want to thank all the staff and instructors in Tabriz branch. I highly recommend the younger students to continue their studying and do not stop it until the end of their life according to Islamic Hadis.” Mir Ghanbar Heydari said. He endured many problems in order to earn his degree. Heydari has a blind wife and he also should look for her wife. A movie has been filmed from the life of this guy named “President Mir Ghanbar”. This movie was broadcasted in Yokohama Film Festival and Locarno International Film Festival.